Bows have existed for thousands of years and are still widely used today, but some changes have been made to improve accuracy, speed and performance. Advanced firing mechanisms and stronger materials used in construction are some of the recent improvements, along with the overall design. Now there are bows that are designed for a specific use and choosing the right one can make the difference between hitting or missing the intended target. When many people think of archery crossbows often come to mind. Thought to have been invented by the Chinese crossbows were commonly used by the ancient Greek and Romans, along with Europeans during the Middle Ages. The shorter design of the crossbow made it easier to carry, which was an important consideration when it was being used by an army on the move. The initial appearance of a modern crossbow has changed little since its introduction, but improvements have been made to its overall construction. Crossbows are characterized by a short bow that is attached horizontally to the stock, and often requires the use of a crank mechanism in order to draw the string back. There are also lightweight crossbows that can be drawn by hand without the aid of a rope cranking device. When the string is drawn it is attached to the firing mechanism and locked into place until fired. Crossbows have a shorter range and require heavier weights to draw fully back, and are often used for target shooting. These bows are generally not recommended for beginners or young archers, and it should also be noted that not all crossbows meet the requirements for competition and tournament shooting. Regulations can vary from state to state and it is important to check before purchasing a crossbow specifically for use in archery tournaments. Interested in buying a crossbow?? 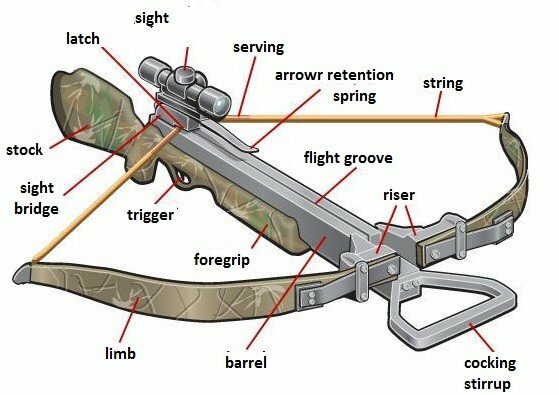 We have a whole section with crossbow guides and reviews; discover the best. These bows first made an appearance in the 1960’s and quickly became popular with hunters and target shooters. While these bows do have a complex design and are often difficult for beginners to load and fire, the improved accuracy, speed and distance makes them a popular choice with small and large game hunters. Compound bows are also ideal for plinking in the backyard and some can even be found at archery competitions. One of the reasons for the bow’s accuracy is its construction. Unlike longbows and other types that are constructed from wood, compound bows are made from synthetic materials. This not only gives it added durability, it also makes it less likely to be affected by humidity or sudden temperature changes. Since the bow isn’t constantly contracting or expanding, distance and speed are also improved. Compound bows do have a complicated design, which can frustrate beginning archers. The draw system is comprised of cams, pulleys and cables which are all designed to help users easily pull a heavier draw weight without causing muscle fatigue. With the added power behind each draw arrows can fly farther at a higher rate of speed, which makes it easier to get a clean shot on a target. Compound bow buying guide, tips and reviews. Easily recognizable by its distinctive design, recurve bows were a favorite weapon among horsemen, and are still used in Olympic archery competitions. The bow was named for its curved shape that puts plenty of power behind each shot, while still being relatively easy to draw. This also makes it a great teaching aid for beginning archers. Recurve bows are designed with the middle part of the limbs curved toward the user with the tips pointed away. It is this innovative design that gives the bow its power, while still being easy to draw even on horseback. These bows are generally constructed from synthetic materials for added durability, and the included components can vary according to the skill and personal preference of the user. Archers just starting to familiarize themselves with a bow often use a “bare” model. These recurve bows only come with the limbs, string, and arrow rest, along with a riser to provide balance when it is being drawn and fired. As the student becomes more familiar with the bow other components can be added. Some of the most common attachments found on recurve bows include sights to help with aim and accuracy, pressure buttons, clickers, and additional stabilizers to ensure a smooth performance. Best recurve bow guide, tips and reviews. It is almost impossible to mistake the shape and size of a longbow, even for those unfamiliar with other types of bows. Longbows were first reported being used in battle in 1298 and were popular with the English and other European armies until the 1600’s. These bows have been around since the Paleolithic Period and can be carved from several types of wood. Modern longbows can still be made from yew, ash or elm, but most are now constructed from durable synthetic materials. Longbows have an extremely simple design, which is one of the reasons for their popularity. The bow was one piece of slightly curved wood carved to match the height of the archer. Since there weren’t any pieces to attach together, a longbow could be easily constructed by almost anyone with access to wood and a knife. Longbows are also designed without sights or arrow rests, which often makes these bows difficult to draw and fire accurately. It should be noted that longbows are not recommended for beginners, and even experienced archers may need some practice before they are regularly hitting their intended targets.